When woodworking projects such as chests, boxes, or drawers are used for storing somewhat odorous objects, the smell from the object will sometimes be absorbed by the wood. This can become especially problematic when the unit is used for other purposes, yet the odor from the previous contents remains. How does one go about getting rid of those odors? Unfortunately, there is no one single answer. A lot will depend on how the wood was finished, the type of wood that absorbed the odor, what the odor is from, and how the unit will be used after the odor is removed. Even knowing the answers to these questions, a few different methods may need to be tried before the problem is alleviated. There are a number of commercial cleaners available that may help with removing various odors from wood. For instance, pet stains are particularly difficult to remove from wood, such as wood floors. Commercial cleaners specifically suited for this purpose are probably the best choice for pet odors. However, you might also try wiping the wood with a cloth dipped with a small amount of ammonia. Use a second cloth dampened with clean water to wash off the ammonia, but take care to keep the joints and edges of the stock dry. Keep your water fresh, and make sure you work in a well-ventilated area. This technique works particularly well on smoke odors. Another simple but often effective wood cleaner used with success is a solution of one part olive oil to 24 parts white vinegar. This equates to two teaspoons olive oil per pint of vinegar. Use the mixture from a spray bottle, and be sure to shake the bottle frequently. Another idea for removing odors from drawers include using newspaper and charcoal, both terrific odor absorbers. Wad up a considerable amount of newspaper and fill the drawer or box with newspaper wads and charcoal briquettes. Leave the absorbent materials in the drawer for about a week before removing and replacing with new charcoal and newspaper. After a couple of weeks, the smell should be much improved. If that doesn't solve the problem, other absorbent items such as coffee grounds, kitty litter, and baking soda are also known to help. Try a paste of baking soda and water for a few hours, again avoiding the end grain and joints. If the item is small enough to fit into a trash bag or even a small locking plastic bag (to seal out any outside air or moisture), simply placing the item into the bag along with an open container of baking soda may help to absorb enough of the odor that it is hardly noticeable. Try leaving the assembly in the bag for 48 hours before opening the bag and giving it a smell test. 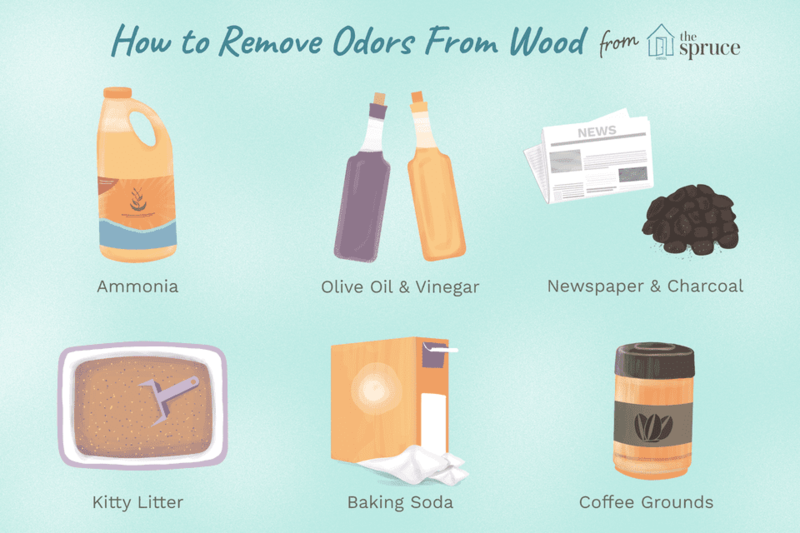 If removing the odor using these techniques fails to provide the desired results, you might want to try to eliminate the problem by sealing the odor into the wood. A few coats of de-waxed shellac (with a light sanding in-between) might help. Shellac is a terrific sealant but isn't water-resistant, so if the unit will be exposed to moisture, you'll want to use something to protect the finish such as polyurethane to seal the wood. Can You Cut More Accurately With a Worm Drive Circular Saw?